HELP! With over 200 scents available, it’s going to take us some time to add each Mason Jar scent with new label imagery to the website. Help us add more new labeled scents by ordering a 14oz Soy Mason Jar and your candle will be the star of it’s own photoshoot! Label imagery will correspond to each specific scent. Make your home smell GREAT for up to 100 hours or more! Each hand poured soy candle is infused with our premium candle fragrances. Now available in all of our 200+ fragrances!! 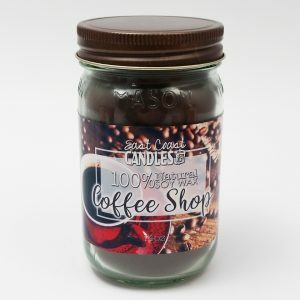 Our 14oz Soy Mason Jar candles are made with 100% natural soy wax. These candles burn clean, and last up to 30% longer than traditional paraffin candles – 100+ hours! Each hand poured soy wax candle is infused with our premium candle fragrance. I love these jar candles! You can tell it’s a high quality product, they burn cleanly and smell wonderful. Love my East Coast Candles so much I give them as gifts. All of our candles have lasted a long time and smell great from top to bottom. My personal favourite is Candy Cane. Grab yourself an awesome candle and support a local, family-run business. Just recently got my Pumpkin Pie jar candle. I keep getting comments from visitors about how great it smells! I have enjoyed my selection I won. Every scent was enjoyable. Thank You so much.